You have probably come here looking for information about Fluxus. Are you looking for an ART HISTORY perspective on Fluxus? If so, click here. You may think that Fluxus is "dead." Not true. It is alive and kicking. 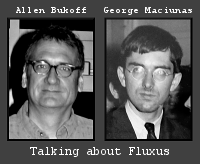 If you're looking for information about how Fluxus-as-art has evolved and what it is up to these days, click here. You may think that Fluxus is only a type of art. Not true. If you are more interested in FLUXUS as a CREATIVE FORCE than Fluxus as a type of art, click here. If you're not sure what you're looking for, then you might try studying the diagram below, and then click on "1" "2" or "3" to take the path you want. We've taken the liberty of filling in our diagram with a few of the many of folks from the original 1960s Fluxus projects and festivals, a few of the many projects and people that have been taking Fluxus in new directions, and some of the Fluxus activities outside of the realm of art.